Michael Cohen was Donald Trump’s personal lawyer and “fixer” for about ten years between 2007-2018. He also held various roles in a few of Trump’s business ventures. Essentially, he was Trump’s right hand man for a very, very long time. After a special counsel investigation into Trump and his associates began, in August 2018 Cohen pled guilty to charges including campaign finance violations, tax fraud, and bank fraud. In September of 2018, he also pled guilty to a charge of lying to Congress regarding a potential Trump Tower deal in Moscow. Cohen went before the House Oversight and Reform Committee to testify about his experiences with Trump and Trump’s potential involvement in various crimes or instances of illegal activity. His big accusations centered around a few key points. First, he claims Trump initiated and then personally reimbursed a $130,000 hush money payment to Stormy Daniels in order to keep her quiet about her affair with Trump. Cohen also told the committee Trump has a convenient habit of lying about his wealth in order to advance his personal gains. Allegedly, he inflated his wealth to land on the Forbes Richest People list, but deflated it to lower his taxes. According to Cohen, Trump was also aware of the soon-to-come WikiLeaks documents about the Democratic National Committee emails. He additionally spoke about his belief, based on personal experience, that Trump is a racist and a conman. A lot to unpack, I know. While I wasn’t able to watch the entire thing, the parts I did see showcased some interesting dynamics. Predictably, there were a few Republicans staunchly in Trump’s corner. They did everything possible to destroy Cohen’s credibility as a witness, bringing up that one of the charges he pled guilty to was, in fact, lying to Congress. One representative even used all her allotted time to question Cohen on whether he would ever sign a book deal about his experiences or gain any television appearances from his testimony. Cohen said he couldn’t say under oath he would never do these things. I get the whole “you stand to gain from this testimony” line of questioning, but I’m going to be honest I really don’t think a potential book deal was the most pressing issue of the day. When I saw how aggressively some of the congressmen were badgering Cohen, I expected him to get really defensive (think Brett Kavanaugh’s confirmation hearing). However, Cohen took it all in stride and remained calm. He consistently leveled with the representatives, repeating numerous times how his blind loyalty to Trump had cost him everything. One of the most hostile and combative representatives was Republican Jim Jordan from Ohio. He not only talked over Cohen various times, it also seemed to me that he was asking things for ~dramatic effect~ instead of to actually hear Cohen answer. Not going to lie, I went into this thinking Cohen was going to be the one acting like a cornered chihuahua, but it turned out to be Rep. Jordan. 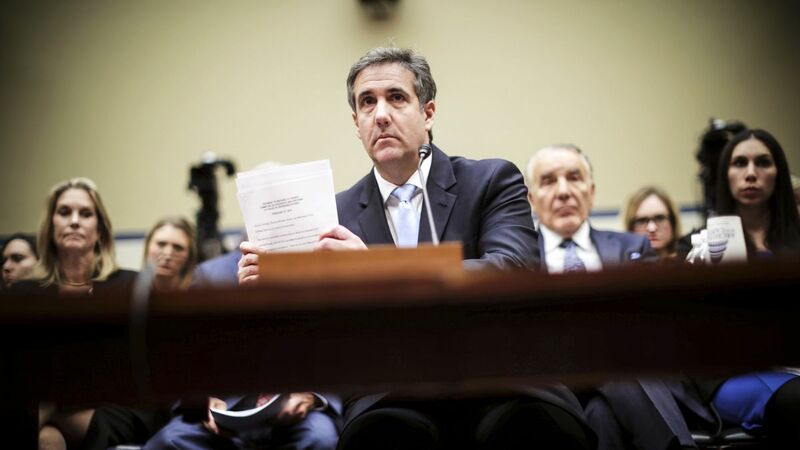 In response to the various attacks on Cohen’s credibility centered on his past dishonesty, one representative aptly reminded everyone that, if people who lied once were forever discredited, then many criminal trials would never exist. I’m not here to play judge and jury on the Cohen testimony, but I will say this: from what I saw, Cohen appeared to be sincere in what he was saying. From his comments it seemed he was genuinely doing his best to recall every minute detail, and didn’t seem like he was there simply because of a vendetta against Trump. At one point, he even told representatives he was surprised their line of questioning was so focused on him and not on Trump. I can’t tell you one way or another the validity of what he said about our current president, but I can say he didn’t have the demeanor of a vindictive guy lying through his teeth.